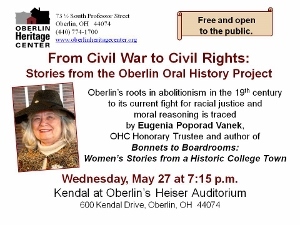 May 27 (Wednesday, 7:15 p.m.) From Civil War to Civil Rights: Stories from the Oberlin Oral History Project. Oberlin's roots in abolitionism in the 19th century affected the views of its residents well into the 20th century as the nation fought for racial justice through prayer, moral reasoning, politics and even violence. Sharing stories from Oberlin's Oral History Project, Geni Poporad Vanek will trace the changes in attitudes from idealism after the Civil War to discrimination during the ‘30s and ‘40s and back to the idealism of the ‘60s in the "town that started the Civil War." Vanek, an OHC Honorary Trustee, is the author of the Heritage Center's oral-history-based publication Bonnets to Boardrooms: Women's Stories from a Historic College Town. Free and open to the public. Location: Kendal at Oberlin's Heiser Auditorium.